Animal Friends, also known as The Good Guys, Animal Buddies, or First Class Friends, is a term relating to friendly creatures that aid Donkey Kong and his friends and family on their various adventures. Some of the ways Animal Friends aid the Kongs are by defeating enemies and unlocking secrets. Animal Friends first appeared in the game Donkey Kong Country and have appeared in most subsequent Donkey Kong franchise games. There is also a separate yet similar group of allies known as Jungle Buddies. 1 — The character is not fully confirmed as being an Animal Friend. 2 — The character is only present in remakes of the game, and not the original game itself. 3 — The character is present in the game, but does not have a full fledged Animal Friend role. A concept artwork in Donkey Kong Country Returns dubs the elephant, zebra, giraffe, and squirrel species of Donkey Kong Island "Animal Friends"; however, unlike the Animal Friends of previous installments, these animals only have a background role in the game due to being hypnotized into stealing the Banana Hoard by the Tiki Tak Tribe, and are not helpers of Donkey Kong. 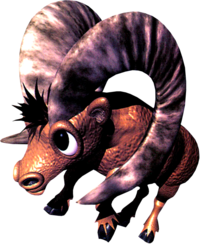 Donkey Kong Land was originally going to introduce another Animal Friend, a ram named Ram Bunkshus. ↑ Donkey Kong Jungle Beat instruction booklet, page 16. ↑ "Animal Friends" concept artwork, "Critters 1 Gallery" in the "Extras" section of Donkey Kong Country Returns. This page was last edited on April 22, 2019, at 04:51.